Library image #2041: Collegiate Peaks seen from Mt. Elbert in the Sawatch Mountain Range. The United States Congress designated the Collegiate Peaks Wilderness (map) in 1980 and it now has a total of 165,864 acres. All of this wilderness is located in Colorado and is managed by the Forest Service. With eight "fourteeners" (peaks exceeding 14,000 feet in elevation), Collegiate Peaks Wilderness probably possesses the highest average elevation of any Wilderness in the Lower 48. You can climb Mounts Yale, Oxford, Columbia, and Harvard (the state's third highest point), as well as Huron Peak, Missouri Mountain, Mount Belford, and La Plata Peak (the state's fifth highest point).Climbing these peaks is a very popular activity, making opportunities for solitude very elusive. Expect to be inundated by people and their dogs on any "fourteener" trail. As you travel through the area, you might notice unusual and deep indentations in the boundary line. These are a legacy of man's hunt for gold and other valuable metals that are still sought just outside. More than a dozen trailheads create a situation in which no one ever stands more than five miles from a road. About 40 miles of the serpentine Continental Divide snake across the area, and this expansive Wilderness lies in parts of three national forests. The beauty of this place and its ease of access ensure torrents of visitors, especially on weekends. Please help keep Wilderness wild by following Leave No Trace practices. In particular, please refrain from having camp fires near treeline. The dwarfed Krummholtz trees that grow there are taking a beating from insensitive campers. 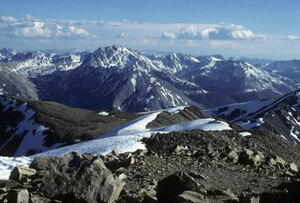 Planning to Visit the Collegiate Peaks Wilderness? How to follow the seven standard Leave No Trace principles differs in different parts of the country (desert vs. Rocky Mountains). Click on any of the principles listed below to learn more about how they apply in the Collegiate Peaks Wilderness.